Tesco have today announced they will not be opening large new stores in Bexleyheath and Dartford. This is the latest stage of a long saga at Dartford, which has also seen a large scale project step up a gear this week. I’ve not covered Dartford much but there’s plenty planned. A large housing development has been announced at the ‘Mill Pond’ site just north of the train station. More on that in a bit. Plans first arose for a Tesco at Dartford in 2004, and since then various options have been announced and then halted. The latest plan for Dartford was a bit of a dog. A shoddy parade of dull, blank, lifeless facades would have extended along Lowfield Street. No flats, much needed, would’ve been located above the large store, despite being a town centre location, and just 34 one-bed and 73 two-beds flats would’ve been built across the site. Looking at the renders of this scheme and the low amount of housing it contained, it seems Dartford has dodged a bullet with this latest cancellation. It’s a great shame 10 years have been wasted and many viable business had to shut in the meantime. This story at Kent Online is just one example – Richardson & Sons butchers were eventually forced to close in early 2014 after 100 years. The owners were threatened with compulsory purchase for a decade as the street was neglected and crumbled, whilst Tesco changed their minds at regular intervals. There was also a large surface area car park it appears – this whole plan was a gross under-utilisation of a town centre location. More people in more homes would help with the huge housing shortage and bring life to a town centre in long term decline. Tesco may now be looking at another development comprising of much more housing and a smaller Tesco express on site and hopefully other small units. If future plans are a good design (with Tesco this is a long shot) this could be a far better solution. The likelihood of making more money through such a scheme, and a hope of starting before the housing bubble bursts, may hopefully see swifter action. Yet more years of delays is the last thing Dartford needs. A great site for information on this and other issues in Dartford is Dartford Matters. Plans for a store at Bexleyheath was located on the site of the former Bexley Council offices. The council has moved to the former Woolwich Building Society HQ. Behind the new council site 127 homes are now being built as part of the deal. Tesco site on left. Housing on right. 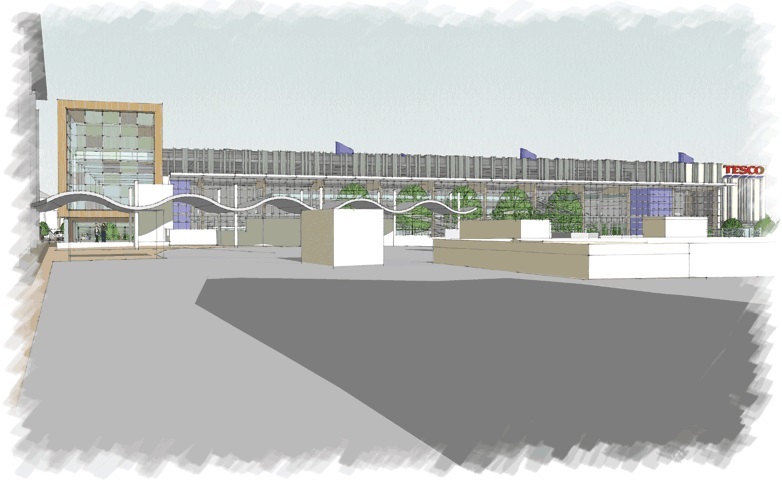 The Tesco store plan was similar to Dartford in that it contained no residential above the retail area. A complete waste of prime town centre land. We just cannot afford to be under-utilising land like this as the population continues to rise. London will soon reach its highest ever population level. Though Tesco at Woolwich is severely compromised in design, the concept of a number of stories of residential above retail in town centres is sound. It is common throughout most of the developed world. Like Dartford cancelling this is a blessing. Hopefully a far better scheme can be drawn up providing homes and bringing more like to this area. 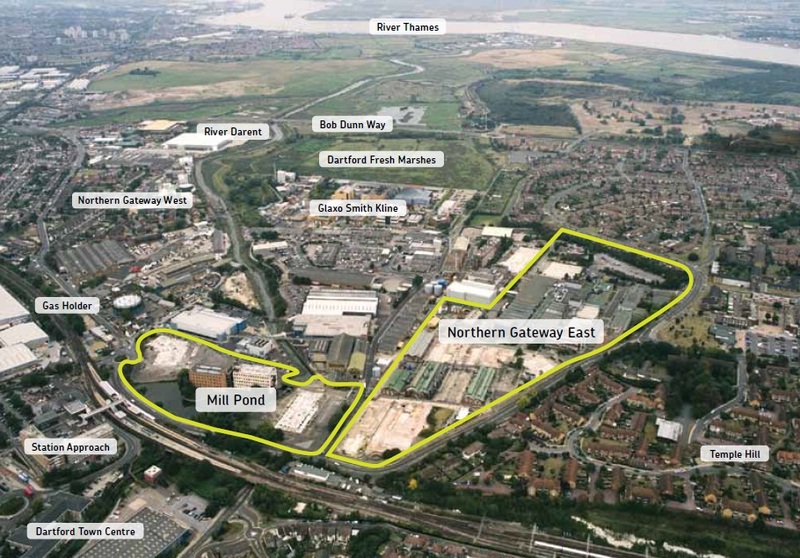 Back in Dartford, news was out this week about a 400 home development at the Mill Pond site located directly next to Dartford station. The image above is from a 2011 planning document of indicative plans and not exactly what is proposed as far as I’m aware. The development of 400 properties is to be built by Weston Homes. of course, it’s been labelled a ‘garden suburb’ as is the fashion right now. Like too many sites, it has lain empty for years – in this case seven – despite the desperate need for more housing. With construction finally underway people should start moving in around summer 2016. Whilst looking up info on Mill Pond I found details of what appears to be a separate development by Weston Homes called Waterford Place. This comprises 117 homes and launches in March. Architecturally it seems bland at best, with many dated features commonplace 10 years ago, and that’s where they should have stayed. The ground floor seems a wall of dead frontages as car parking placed there instead of basement level, to save money. There’s many more potential sites as shown below. Barrett Homes are currently selling houses off-plan for it’s Phoenix park development next to Mill Pond. This will be 650 homes in the south of the ‘Northern Gateway East’ site. All these plans again highlight the strain southeastern train routes will be under. It increases the need for new trains to lengthen services and extending Crossrail to Kent. As in Woolwich, Dartford has a large amount of under-utilised space ideal for housing. To the south of the station there are very large surface car parks on what seems to be council and Network Rail land. Alongside are giant retail parks in completely inappropriate areas. There’s more than enough land for many houses, and a concerted effort to build houses to deal with the issues would unlock them if central government places emphasis on it, and local authorities are empowered to build and play a far greater role. Leaving it to the private sector since the 1980s has seen building at a trickle, far below levels seen for most of the 20th century until then. Also nearby at Erith this week, Boris turned up and proclaimed how great his ‘affordable housing’ plans are as the first houses opened at the redevelopment of Larner Road estate. And what does that scheme give? In Erith, 240k gets you just 40% of a shared ownership house and having to pay additional rent on the rest. Shared ownership is a wheeze. The young paying high prices for 40% of a house, when their parents generation would’ve got 100% for the same price. In reality, older generations would’ve been able to buy 100% of a house for less than the 40% now provides. Help to Buy is a way to continue propping up this bubble instead of allowing prices to fall, improving the lives of the young. Spot on in nearly every respect. 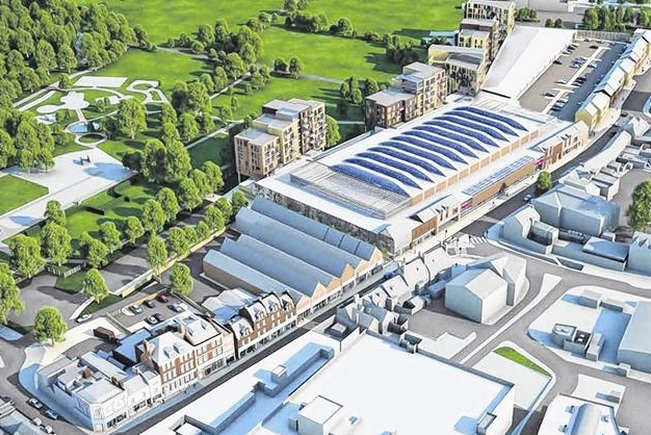 Both Dartford and Bexleyheath ought to have had better proposals for these town centre sites and it may be that in the end most people bless the day Tesco put these schemes on hold – but the big question now is ‘what happens to these now empty sites?’. Will they be allowed to blight these towns for years (and in the case of Darford, even more years)? I am not a fan of shared-ownership nor Help-to-Buy: to me they seem like ways of being able to keep prices high. Hear, hear Steven. I too, echo your sentiments about shared-ownership, and this tory-led coalition’s Help-to-Buy scheme. One thing you can bet on with a company like Tesco. Is that they will dictate terms on how the land they are no longer going to use themselves, is used by the local authority. And, they will make damn sure that none of their competitors get their hands on it. I’ve been researching for several decades [!] the mill that once occupied the BW&Co/GSK site N of the mill pond and have been looking for an oblique aerial shot showing the relationship between Dartford and the Thames without luck until you posted ‘dartford-sites-aerial.jpg’ above. Can you tell me where you got it so I can ask for a copy without the annotations?